Lupin III is coming back, and he's bringing an array of anime talent with him. Long running anime/manga/everything-else-you-can-think-of franchise, Lupin III, has been handled by numerous different writers over the years, with an arguable highpoint being the second feature film, The Castle of Cagliostro, which was written and directed by a pre-Studio Ghibli Hayao Miyazaki. There may be some competition for that spot now, however, as the upcoming new TV series has brought together an impressive collection of big anime names. Lupin III -The Woman Called Fujiko Mine is written by Dai Sato (Cowboy Bebop, Eden of the East, Samurai Champloo) and directed by weird existentialist director, Say Yamamoto (Ergo Proxy, Technolyze). Mari Okada, of AnoHana fame, has also been tagged for writing duty. Character designs are being provided by Takeish Koike. Koike handled the character designs for the visually stunning, Redline, and has animation credits in pretty much every awesome late 80's OVA you can name. We're talking Cyber City Oedo 808, Goku: Midnight eye, Wicked City, etc (if it was silly, vaguely exploitative and appeared on the Sci Fi channel at 3am during your teenage years, chances are he worked on it) as well as a slew of modern features. The music is being handled by Naruyoshoi Kikuchi, who not only gave Trigun its fantastic soundtrack, but is also an industry leader in sheer, unrelenting swag. The Woman Called Fujiko Mine is a prequel to the original Lupin III TV series. 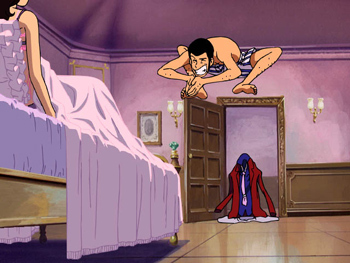 It details the adventures of lecherous master thief, ArsÃ¨ne Lupin III, and his various cohorts (particularly his flip-flopping, kind-of-girlfriend Fujiko) during their earlier years. According to reports the show will be a little racier than the largely slapstick antics of the original series. The first episode airs in Japan on April 4th, no doubt to be swiftly followed by fan translations of varying quality.